I'm sure that many wargamers sometimes get the urge to set aside their current projects for a time and paint something completely different. This happened to me a couple of weeks ago. I was up in the loft and started looking in the sets of drawers that house my "non-core" leadpile (i.e. all those figures that don't directly fit into the projects I have been working on over the past 2 years). 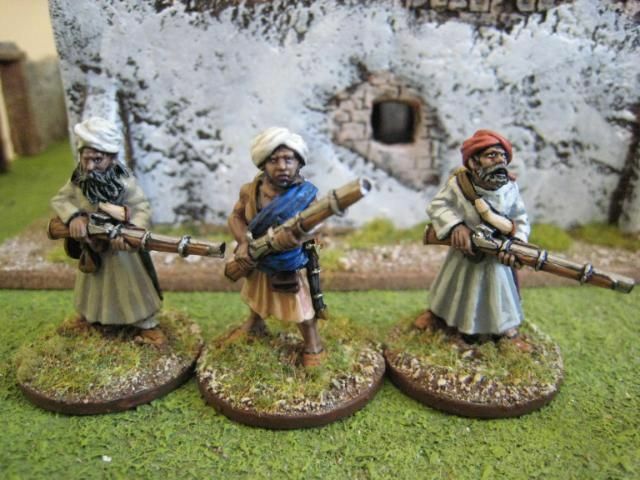 I came across 3 packs of Foundry Baluchis and decided to paint them up over the next couple of weeks. 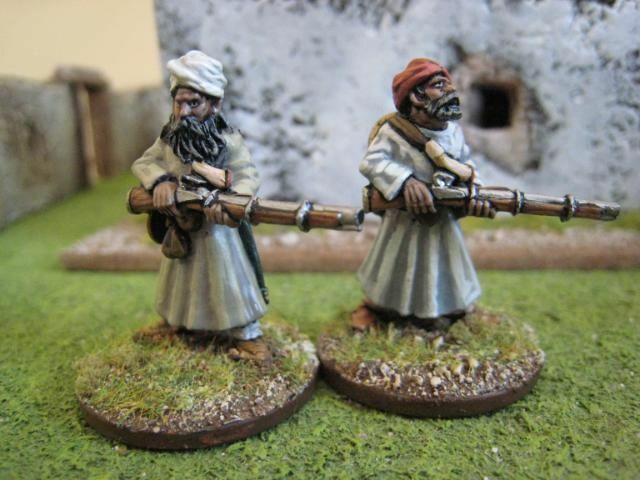 At the back of my mind was the idea that I could use them as mercenaries or volunteers for the Sudan (although these figures are substantially larger and chunkier than those in the Perry Sudan range). I already have 2 packs painted up so eventually I will have a decent sized skirmish force. 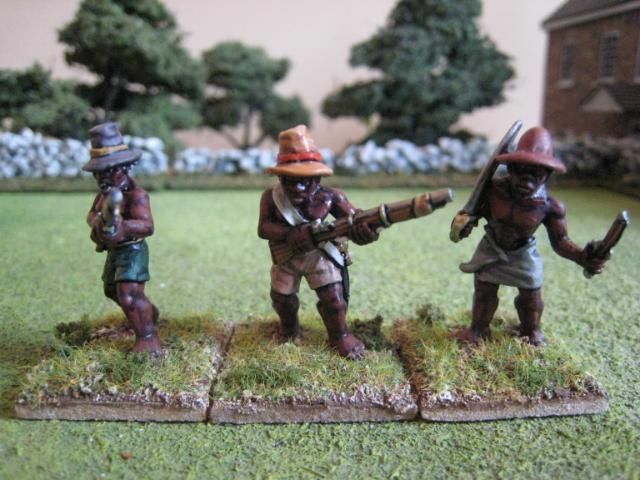 I avidly collected the Darkest Africa figures that Mark Copplestone made for Foundry when they first came out, some 10 years ago. This was Foundry's golden age, when every month they released lovely sculpts from the hobby's best sculptors. You could sign up to a standing order system for their new ranges, whereby each month you'd receive a long box with between 6 and 8 packs at a 10% discount. I quickly signed up for the Caesarean Romans, Macedonians and Darkest Africa ranges (back in those days I wasn't the least bit interested in the AWI range, which was being released at the same time!). Of course Foundry then imploded, its sculptors left to start their own businesses and the rest is history. 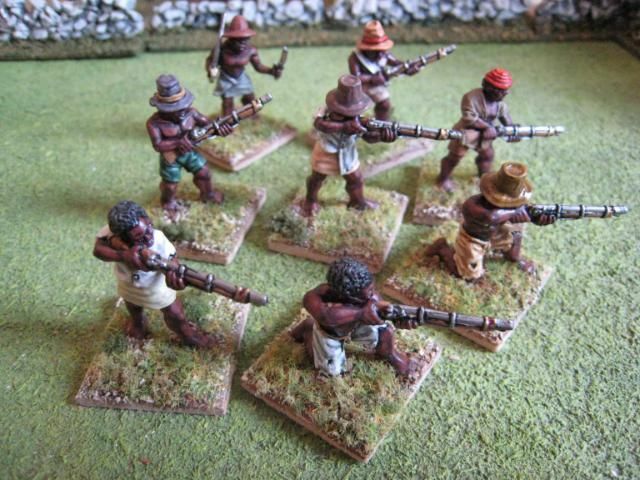 I managed to paint a good few packs of Darkest Africa figures but didn't base any of them. I began doing so a couple of years ago and one of my aims this year is to finish basing the remainder. 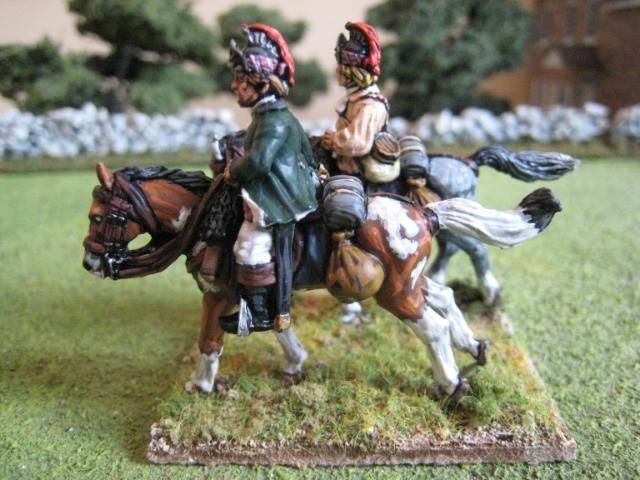 In the meantime, several of the later packs have not been painted at all and I intend to paint a couple of them every now and then as a change of paint from horse and musket. 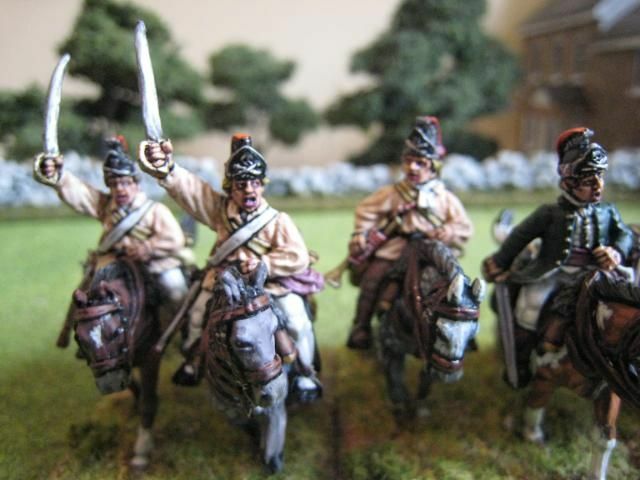 These figures form one old pack - nowadays the figures are split over a couple of packs, as Foundry meanly reduced the number of figures in their packs from 8 to 6 a few years ago (which was a disaster for the AWI range as it meant that the British command packs only had 1 standard bearer - useless!). The skin is painted with one of the newish Foundry flesh palettes - "Near Eastern Flesh 123". Painting people from Asia is always tricky; some are almost caucasian in colour whilst others can be quite dark. This palette seems to me to be a good compromise and I've also been using it for my First Crusade arabs. 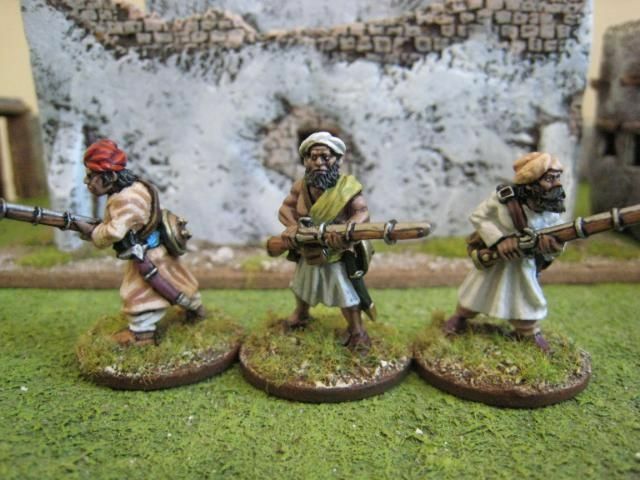 I'm currently painting a second pack of Baluchis so they should appear on the blog next week some time. 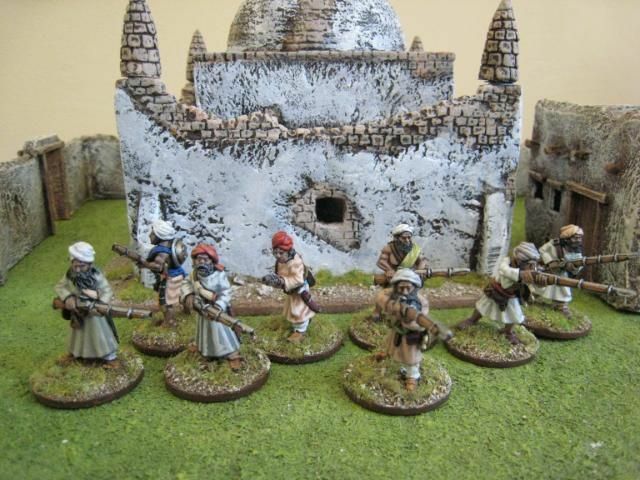 The main building is a tomb from Hovels, bought ready painted and based at Salute. The walls and other bits are by Paul Darnell of Touching History. 8 figures. Painted May 2010. 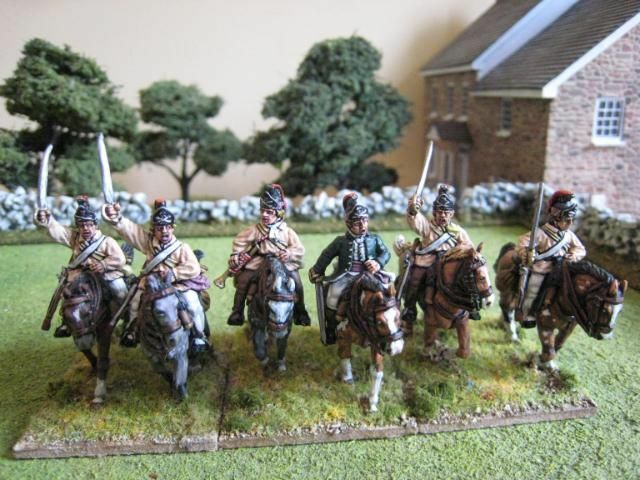 The 17th Light Dragoons arrived in America in 1775 and remained until 1783. The death's head badge on the helmet is said to have commemorated the death of James Wolfe at Quebec, although an alternative idea is that the motif is modelled on the Prussian Army's Black Hussars. The regiment saw service throughout the war in the north. 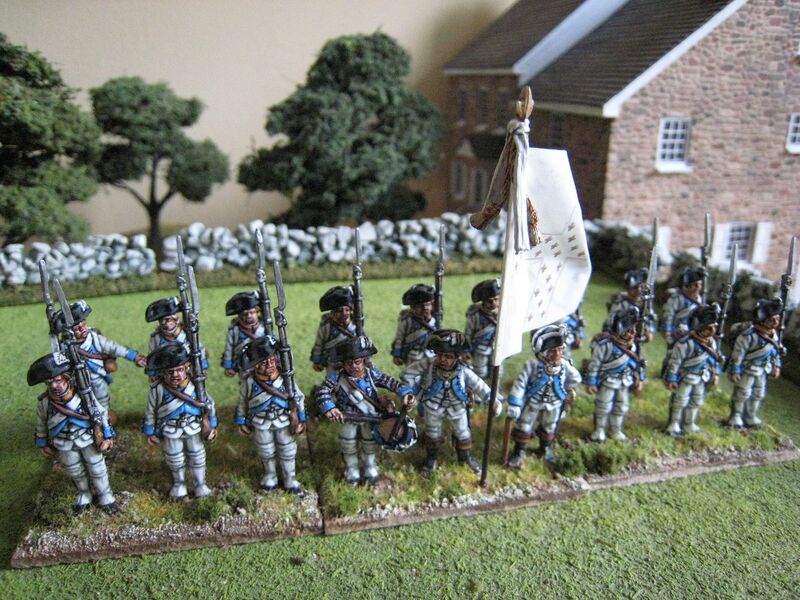 In 1779 the regiment was sent to serve with the British Legion in the Carolinas ("stiffen" the Legion is the word used by Stuart Reid in the "King George's Army (3)" Osprey). The troops were engaged in numerous raids and skirmishes. In the published "British Grenadier!" 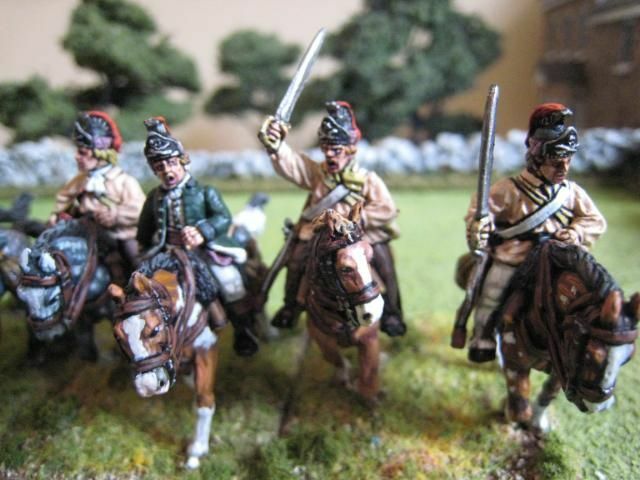 scenarios, the southern 17th appear only once, as a 6 figure unit at Cowpens. 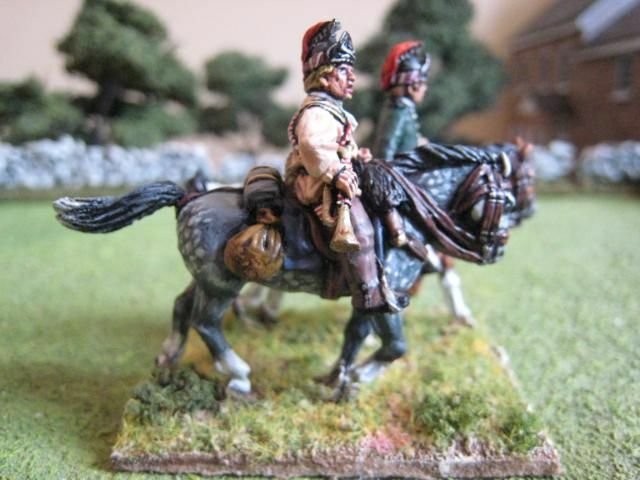 I want to build up my AWI cavalry his year, and I'm going backwards with the 17th - starting with Perry figures for the later, southern theatre and I'll finish with a 12-figure unit in full dress for the early part of the war (via one or two other things). In the south, the 17th wore white linen smocks due to the heat, although I have seen references to these being worn either instead of or over the regulation uniform. 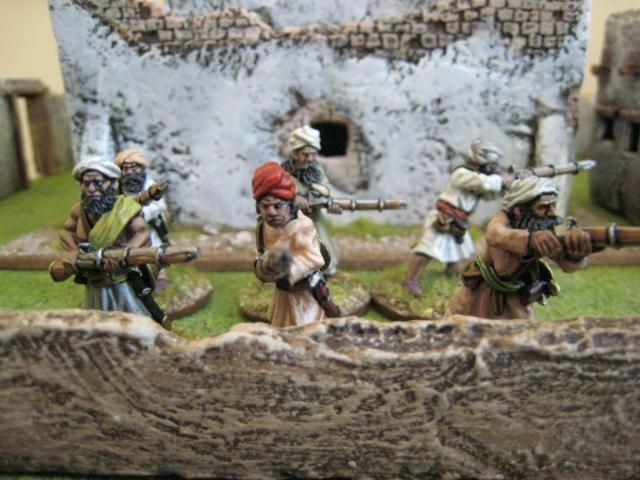 I painted the smocks on these figures with Foundry's "Palomino 56" palette as I wanted a creamy rather than white look. The officer's coat shows a bit of artistic licence. I thought it would look a bit odd if the officer wore the same coloured coat as the men - it's clearly a well-tailored coat rather than a smock. 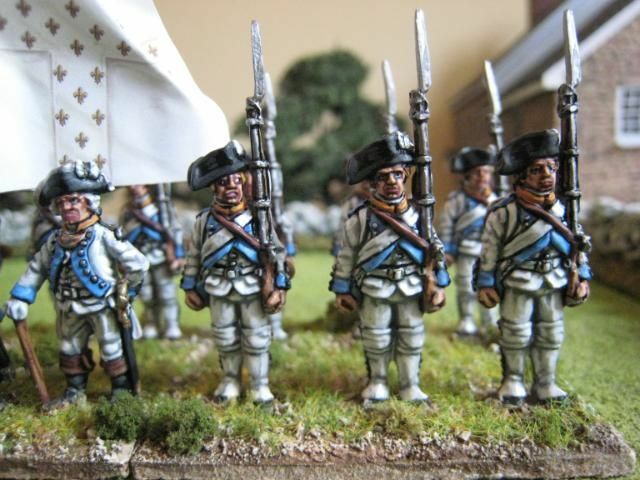 I thought I could paint it a slightly different shade of cream (as shown on the Perry Miniatures website), but that seemed a bit too "civilian" and I wanted something that was clearly a uniform. The cut of the coat is not quite right for the 17th's regular uniform, so I decided to paint it in dark green as a nod to Tarleton's Legion. I have read that the 17th were very proud of their uniforms when serving with the Legion, but maybe this officer had agreed with a loyalist friend that he would wear a green coat for the day, or his own uniform was being mended and this is his "No.2 suit". It's not historically accurate, but the green adds some colour to what are otherwise fairly uninteresting uniforms. 6 figures. Painted April 2010. The Armagnac Regiment was part of the Comte d'Estaing's force, the first French troops to participate in the AWI and which arrived in America during summer 1778. After the failed attack on Rhode Island, the French force moved off to the Caribbean and attacked St Lucia, which had been captured by the British. 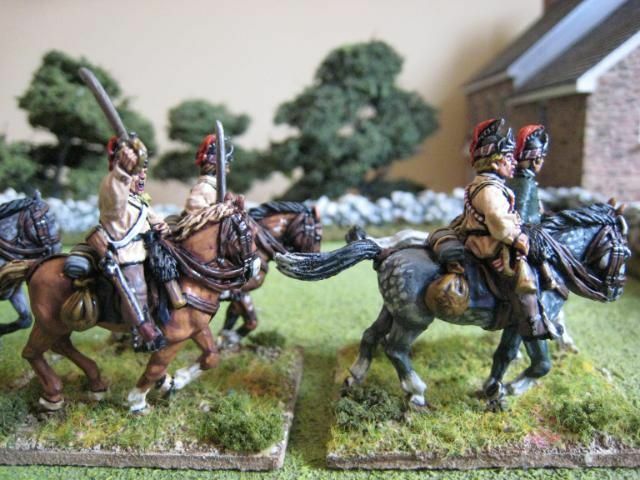 The resulting battle of La Vigie is in the first "British Grenadier" scenario book, which requires two battalions of the Armagnac regiment at 18 figures each. They are in the earlier uniform. A wiki search reveals that a post AWI colonel was one Comte Alexandre Andrault de Langeron - this chap was an ardent royalist who left France when the revolution started and joined the Russian army, rising to the rank of General and commanding a corps in 1814. As this is the first battalion, the flag used is the white colonel's colour; the more colourful drapeau d'ordonnance will go to the second battalion. 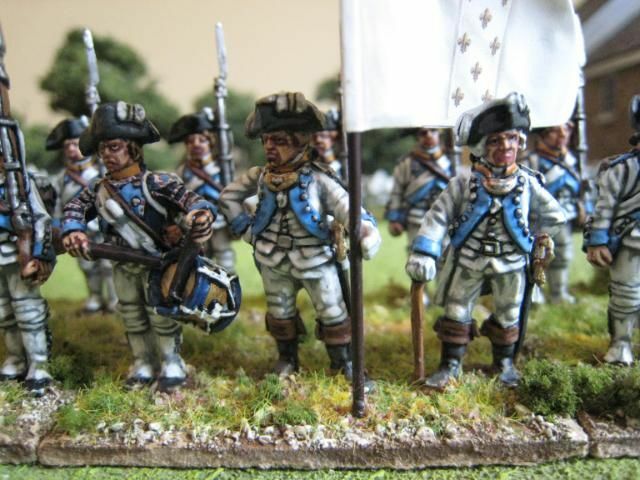 The distinctive French finial and cravat was sourced from Front Rank, who sell these things in packs. 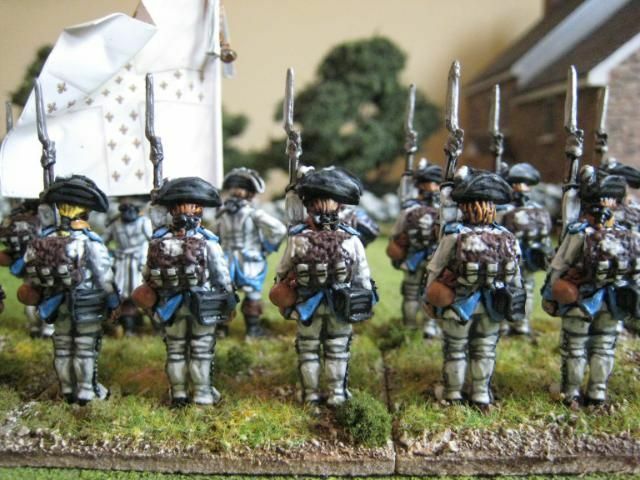 Given the white uniforms of these troops, I used a grey undercoat rather than my usual black one, specifically Army Painter's grey spray which is an exact match with Coat d'Arms "525 Uniform Grey". I then used my usual Foundry and Coat d'Arms paints to build up to the final pure white highlight. 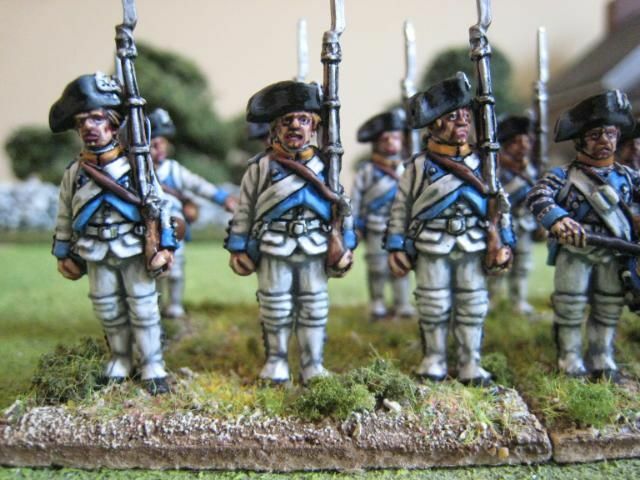 I continued to use blacklining but for the white uniforms and gaiters I used Coat d'Arms "533 Slate Grey" instead of black to create a slightly softer look. Overall I'm happy with how these figures turned out (although the quality of photos still leaves much to be desired!). I'm afraid work has intervened to prevent more regular posts. 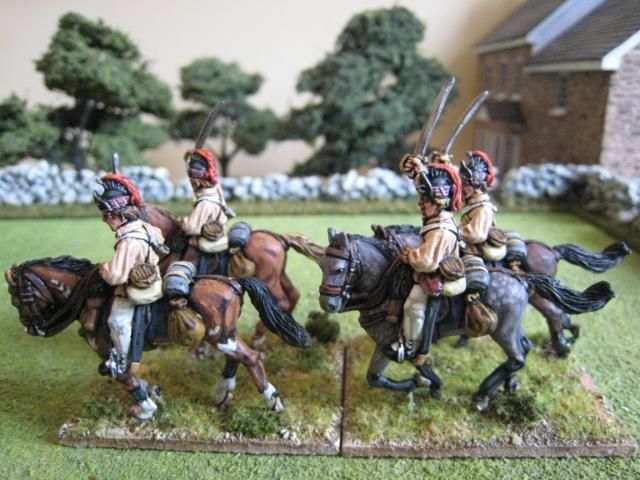 I have a load of stuff photographed, AWI (British cavalry) and Sudan, so hopefully next week will see more posts. 18 figures. Painted March/April 2010. Flag by GMB. 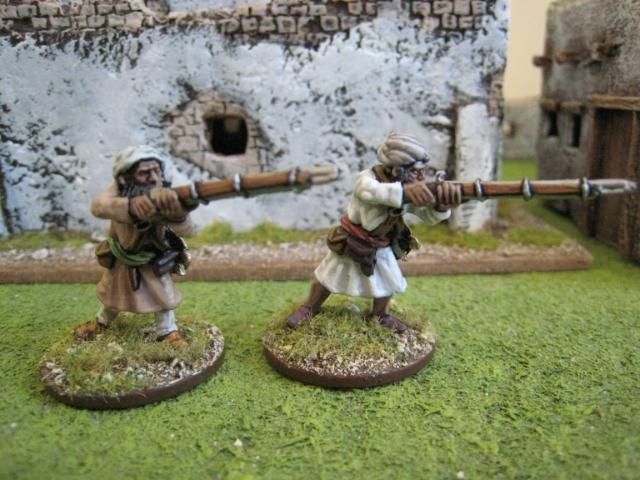 Trent Miniatures have a couple of packs of "revolting slaves" in their Later French Revolutionary Wars range, available in the UK from North Star. The range covers the Caribbean as well as north Italy and Ireland. I am not entirely sure who sculpts for this range; Mark Copplestone makes the personality figures but the rank and file stuff is clearly the work of someone else. I saw the slave figures and thought they might come in handy for the wiser reaches of the AWI. 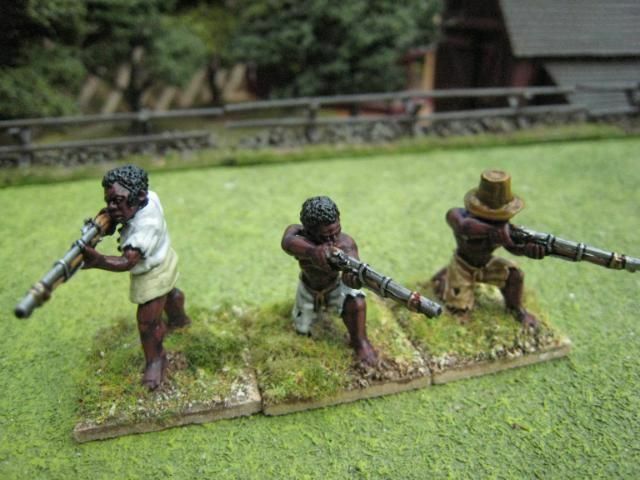 There is one pack of slaves with firearms and a second one with "armes blanches", i.e. swords and improvised weapons. These figures are clearly from the first pack, which contains 8 different figures. The North Star website shows "5 of the available figures", which is interesting because only one of those figures was contained in my pack - there must be at least 12 different figures and presumably each pack has a random selection. I find this sort of thing a bit annoying, because you might be after particular figures and when ordering mail order without the chance to inspect each pack you simply don't know what you're going to receive. Anyway, the figures are nicely sculpted and paint up well. They are well detailed and some of the figures even have scars on their backs. 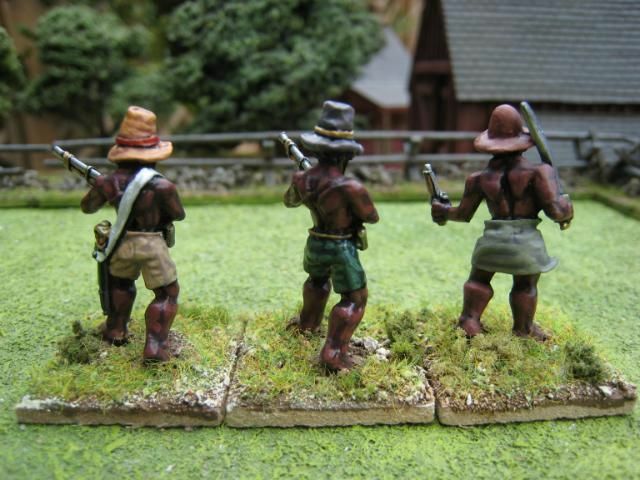 I'm not too sure about the top hats that a couple of the figures are wearing - I have no idea whether this is a Caribbean thing or symptomatic of the figures being intended for a later period than the AWI. 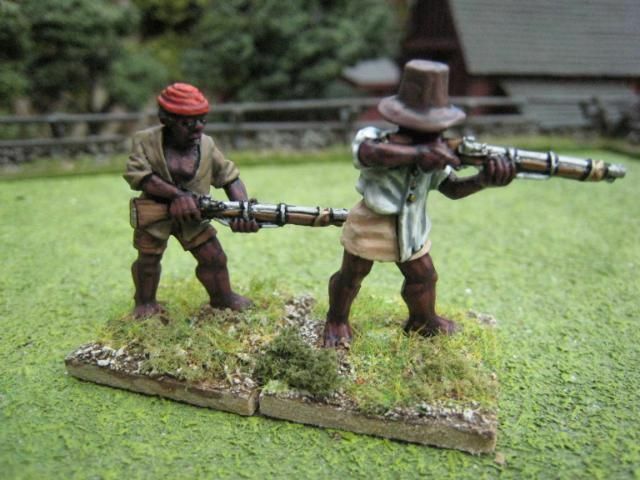 The figures are all based on 25mm squares, this being the size for skirmish bases under the "British Grenadier!" rules. The flesh was painted with one of the new Foundry palettes, "African Flesh 126". The range gives you a choice of 3 African palettes; "North African", "Dark African" and this one. To be honest, I have no idea which peoples and tribes are more suited to which palette. The "Dark African" paints are almost black and I did wonder whether they would be more suitable. 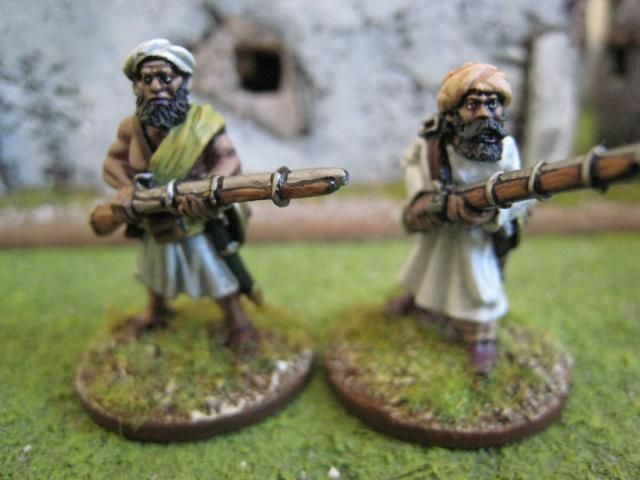 I will probably paint up the second pack of slaves at some point and will keep an eye on the Trent Miniatures range for anything else that might work for the AWI. 8 figures. Painted March 2010.